Mao Zedong var ikke alene en revolutionær leder og tænker, men også digter. I klassisk kalligraferede digte udtrykte han sine erfaringer og visioner. I filmen synges, reciteres og udlægges 8 af Maos digte: 'Changsha' (1925), 'Jinggang Bjergene' (1928), 'Den Lange March' (1935), 'Sne' (1936), 'Folkets Befrielseshær erobrer Nanjing' (1949), 'Svømning' (1956), 'Svar til Kammerat Guo Moruo' (1961) og 'Gensyn med Jinggang Bjergene' (1965). Gennem digtene skildres den kinesiske revolution fra dens spæde begyndelse i 1921 til Kulturrevolutionen. Mao Zedongs digte er udkommet i mere end 57 millioner eksemplarer. Mao Zedong was not only a revolutionary leader and thinker, he was also a poet. 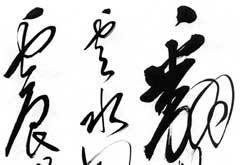 In poems written in the classic calligraphic tradition he expresses his experiences and visions. In this film, 8 of Mao's poems are sung, recited and interpreted: 'Changsha' (1925), 'Jinggang Mountains' (1928), 'The Long March' (1935), 'Snow' (1936), 'The People's Liberation Army Captures Nanjing' (1949), 'Swimming' (1956), 'Reply to Comrade Guo Moruo' (1961) and 'Reascending Jinggang Mountains' (1965). Through these poems we get a picture of the Chinese revolution from its first beginning in 1921 until the Cultural Revolution. The poems of Mao Zedong have been published in more than 57 million copies.